Field corn is grown on more acres than any other crop in the U.S. and is one of the most widely farmed crops throughout North America. 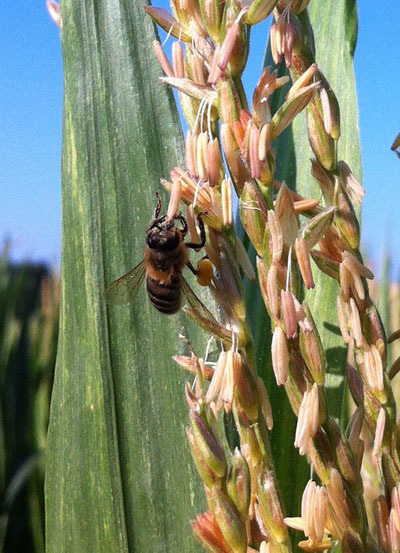 Although honey bees are not essential to corn production, they are commonly found foraging in corn fields, especially in landscapes where other foraging sources are limited. As a result, the practices corn farmers use can affect honey bee health. Given this, the National Corn Growers Association worked with a broad array of Honey Bee Health Coalition members, stakeholders, and growers to develop best management practices to help protect honey bees and other pollinators in and around corn fields. This document presents best management practices — from pre-planting to vegetative stages to post-harvest — for conserving and promoting the health of pollinators, particularly managed honey bees, in conjunction with corn production. The recommendations attempt to identify potentially negative impacts of corn agricultural practices on bees at each stage of corn production and suggest strategies to mitigate these impacts without negatively affecting farmers’ bottom lines. These practices should be treated as recommendations that complement pesticide label instructions. Communicate: This is one of the most important factors in preventing acute poisoning of managed bee hives from exposure to pesticides. When growers and beekeepers are aware of each other’s locations, concerns, and management practices, they can take steps to avoid pesticide exposure to hives and foraging bees. Many states have Managed Pollinator Protection Plans (MP3s) or similar programs to facilitate this communication. Other resources include state-based registries for apiaries, which show pesticide applicators where honey bees are located. Farmers and applicators can contact their state or local department of agriculture, state apiarist, or similar organization to find out the best methods for contacting nearby beekeepers. Beekeepers also should take measures to make sure nearby farmers are aware of their operations. Check before you spray: Growers should follow recommended economic thresholds and university extension recommendations to guide pest management decisions and consider multiple strategies for control that include non-chemical options (e.g., resistant varieties, cultural practices). Always follow the label: When insecticides or other pesticides are used (either by growers or by beekeepers managing hive pests or forage), label instructions must be followed. Remember that label restrictions are legally binding under federal, state, and tribal law. Practice good hive management: Poorly managed hives are more susceptible to stresses from parasites, pathogens, other pests, and poor nutrition. Healthy hives with access to plentiful forage are more resilient when confronted with additional stresses, including pesticides, than are hives at risk from multiple stressors. Provide food and water: Where possible, include flowering plants in non-crop areas. Avoid pesticide drift onto non-crop areas with flowers. Leave areas with these floral resources intact whenever possible. Please note: The label is the law, and it is a violation to apply pesticides contrary to label instructions and warnings. Voluntary adoption of best management practices can help further mitigate harmful effects on managed honey bees.